4. The air delivery distance is more than 50m. 5. 201# or 304# Stainless steel shell, solid and durable. 6. 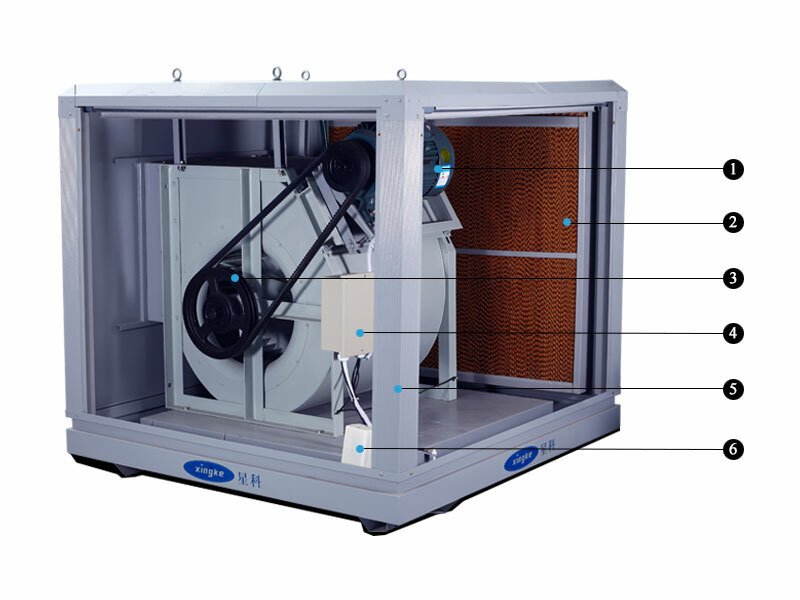 High efficient evaporator, high evaporate rate, good cooling down effect. 2. 100mm thickness 5090# cooling pads. 6. Water pump and drain pump. 1. Cast iron motor body. Anti-corrosion. 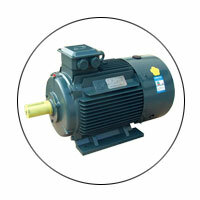 100% copper-wire motor winding. 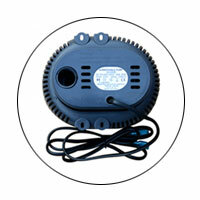 Water-proof Rate IP 54,INS Class B. 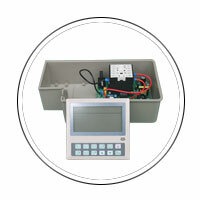 Long working lifetime, 2 years warranty. Power:5.5KW,7.5KW,11KW,15KW, 18.5KW…32KW. 2. 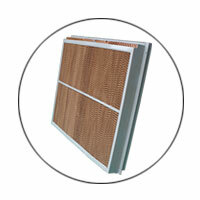 Cooling Pads.100mm thickness 5090# cooling pads. Raw material from Jia Mu Si, deodorant treatment, more than 80% evaporate rate. Perfect edge protection, 3 years warranty. 5. Body case.Spraying 201#stainless steel material. 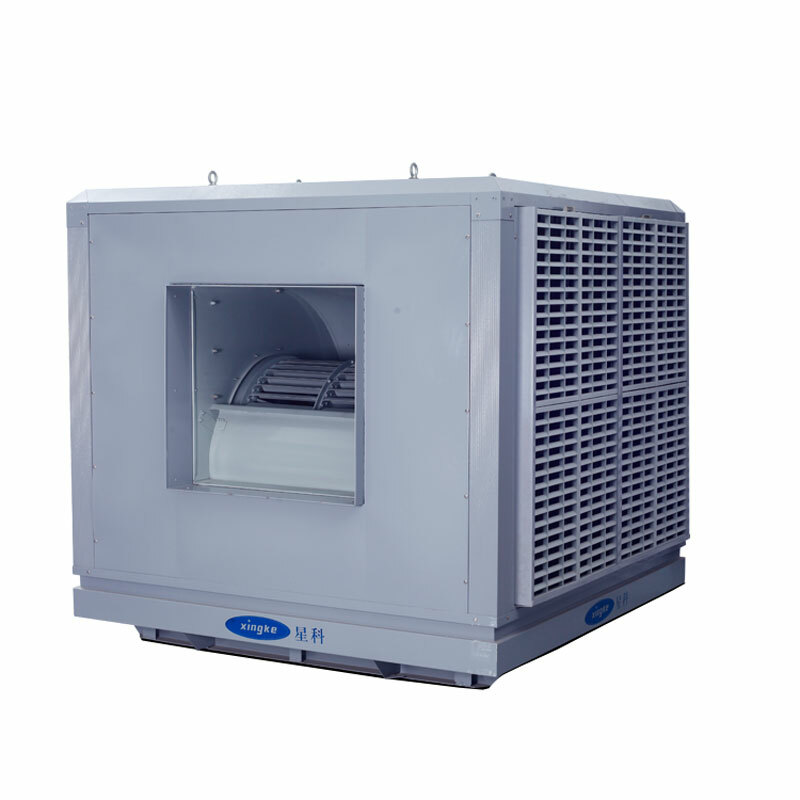 Anti-Corrosion, Anti-Rust, Better Heat-resistant performance. 3. 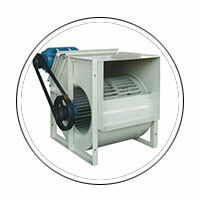 Centrifugal fan. Belt-drive centrifugal fan Zinc coating centrifugal fan and volute. 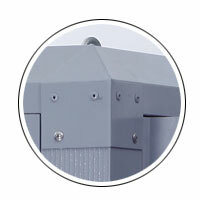 Anti-rust,Anti-Corrosion Stainless steel fastener,make sure stable operation. 6. Water pump and drain pump. Ceramic shaft submersible pump. Barrier-free mechanical drain pump, corrosion resistance and efficient performance, 30000 hours continuously working life.